In the 2015 film “Ex Machina,” a neurotic tech billionaire creates an artificially intelligent humanoid robot inside his mansion in the woods. 6 | Much of the home used in the final film is actually a hotel. 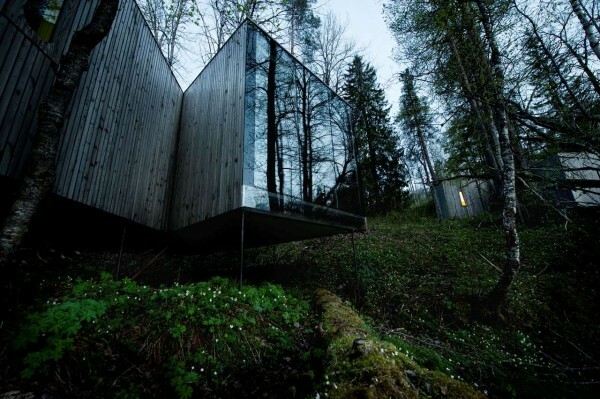 The Juvet Landscape Hotel, from the Norwegian team at Jensen & Skodvin Architects. 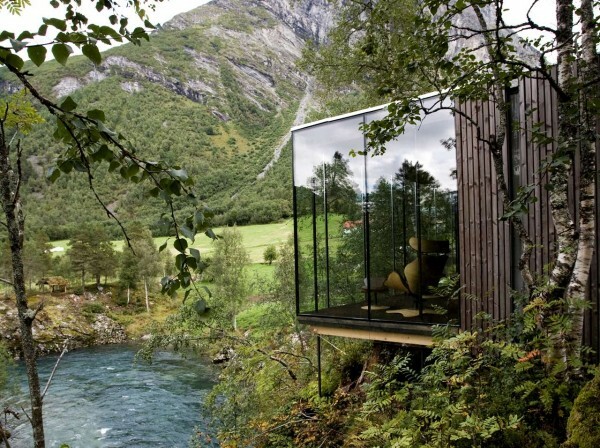 Although the film takes place in Alaska, this stunning hotel is actually found in a remote area of Norway. The hotel, which has not been open long, is nestled among rocks, forests, and water. It plays the part of the billionaire’s dining room but is also available for booking – if you can afford it. There are so many different pieces that go into the creation of a film. From the first keystroke that starts to write a story, characters with all their inherent quirks, traits, and personality are spun from thin air. When a film actually starts to take shape on-screen, those traits have to be reflected not just in the actor chosen to portray the character, but in the scenery, design, and every image. In a movie like recent science fiction film Ex Machina, those necessities are heightened. A near future and a billionaire protagonist need to have a very specific setting (remember Tony Stark’s house?) that sometimes may not just physically exist. The filmmakers did not find a perfect setting and instead cobbled together two real life locations with visual effects and sets to create a stunning world for their artificial intelligence opus. source Juvet Every room (except the bathroom and bedroom) in the pods has floor-to-ceiling windows. 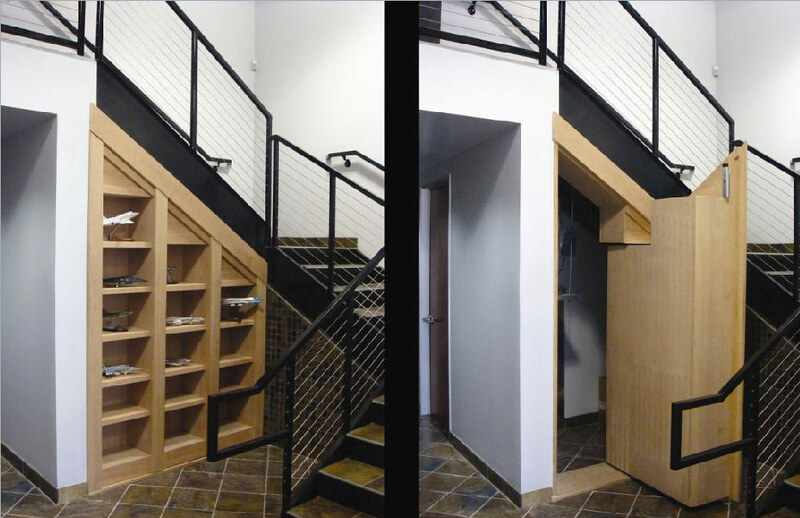 The transparent walls are angled in different directions, maximizing privacy. 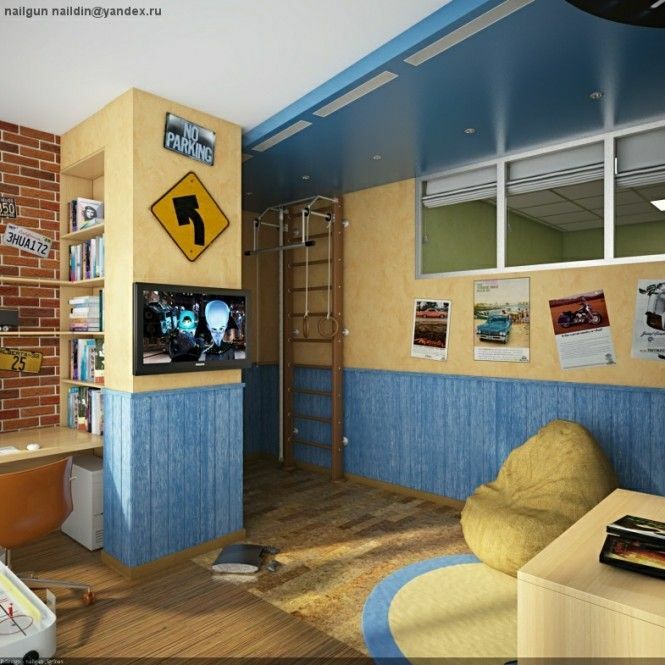 source Juvet Each 250-square-foot pod features a bedroom, study, bathroom, and living space. source Juvet Guests enjoy amazing views. 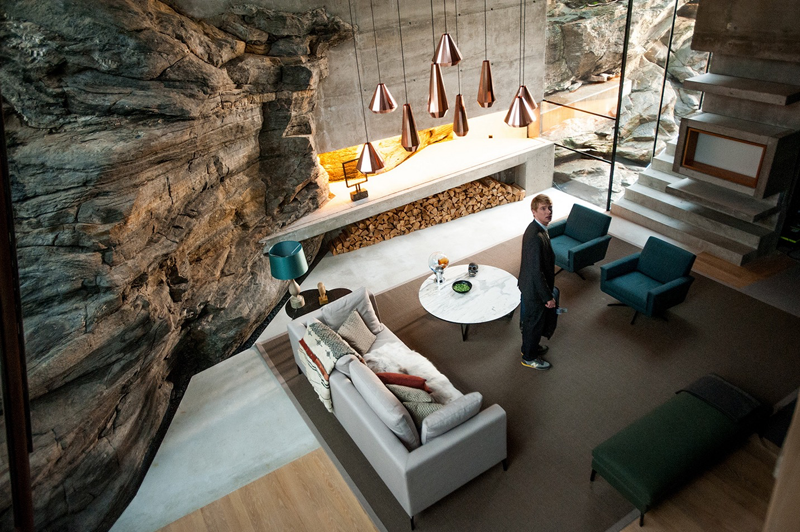 source Juvet Here is a pod’s living space, where the main characters in “Ex Machina” — computer programmer Caleb Smith and the Dr. Frankenstein-type Nathan Bateman — sit and chat for the first time: source Juvet Smith and Bateman speak to the humanoid, Ava, while she stands in a room made of completely transparent glass walls. But in the real Juvet, all of the interior walls are frosted. source Juvet The pods’ bathrooms are also brighter than the drab ones in the film. source Juvet The rest of the interior, which emphasizes natural materials like concrete and reclaimed wood, is more muted. source Juvet Since western Norway’s temperatures can dip to below zero degrees Celsius in the winter, every pod has heating and a fireplace to keep guests toasty. source Juvet There is also a common pod that all guests can use. 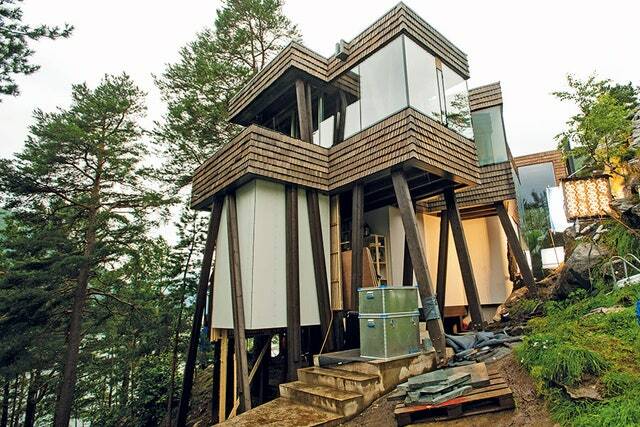 The room in the common area pictured below serves as a dining room, just like it did in “Ex-Machina.” source Juvet On the 430-square-foot deck outside this pod, there’s a hot tub that overlooks the Valldola River. In the film, Bateman uses a punching bag near this tub. 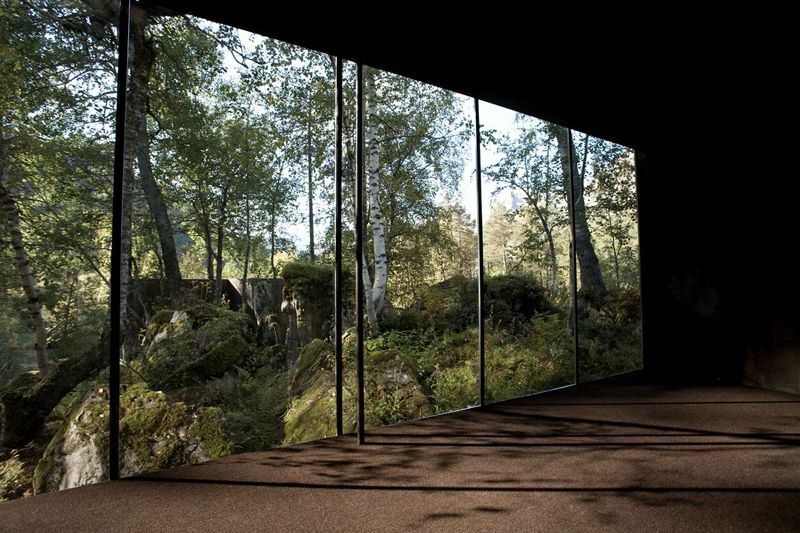 source Juvet The architects, Jensen & Skodvin, tried to make the hotel’s design feel integrated with nature. Thanks to Juvet’s expansive windows, guests can peer out … source Juvet … and admire the surrounding nature. 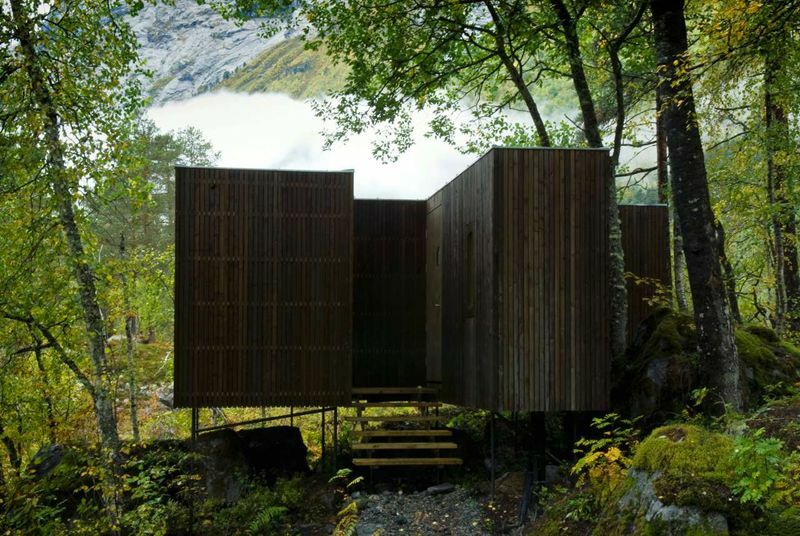 The Juvet Hotel is made up of nine wood-paneled pods scattered throughout the woods, owner Knut Slinning tells Business Insider. 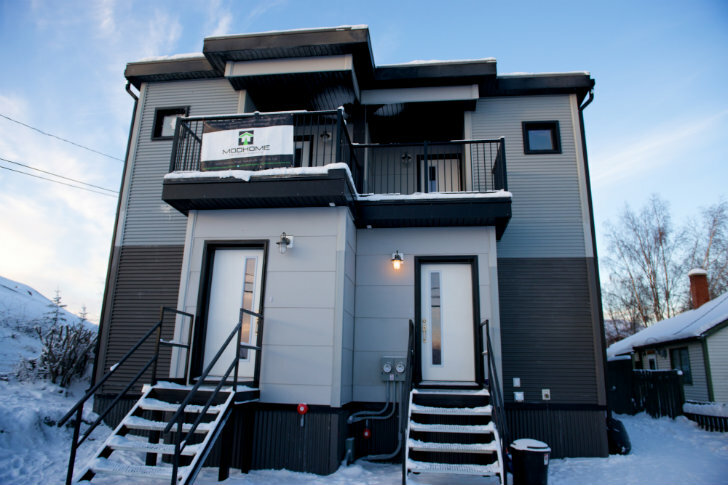 Two guests can stay in each pod. source Juvet To reach some of the pods, guests need to traverse this curved, steel bridge that hovers above the rapids. 13 | Some of the home interiors, such as these of the living room, were shot at a separate location. 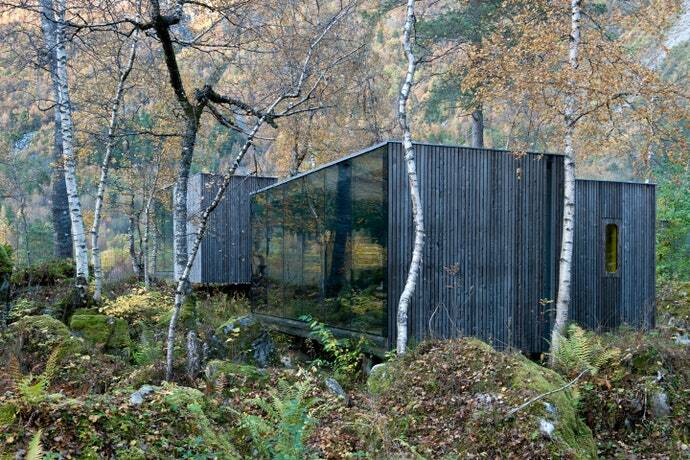 A private summer house, also designed by Jensen & Skodvin, speaks to the themes of the movie. 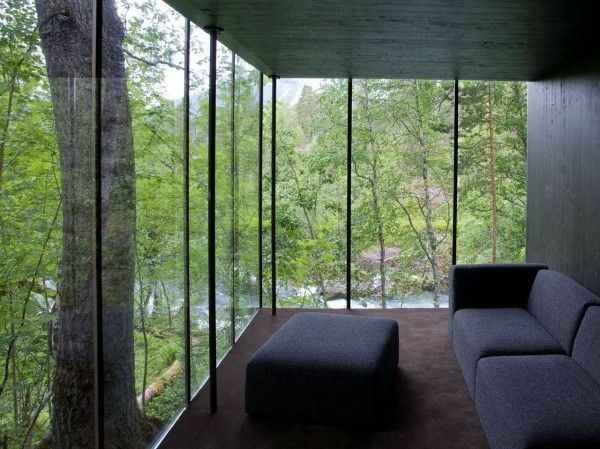 The home and its sleek modern aesthetic is actually carved into the side of a mountain. Cliffs and rocks come into the house and must be worked around, just as the film uncovers so many elements of the nature that man is up against when working with technology. 7 | There is something inherently luxurious about seclusion. Even if it were not for the stunning, modern design behind these gorgeous interiors, being far removed from society provides both safety as well as a bit of danger. 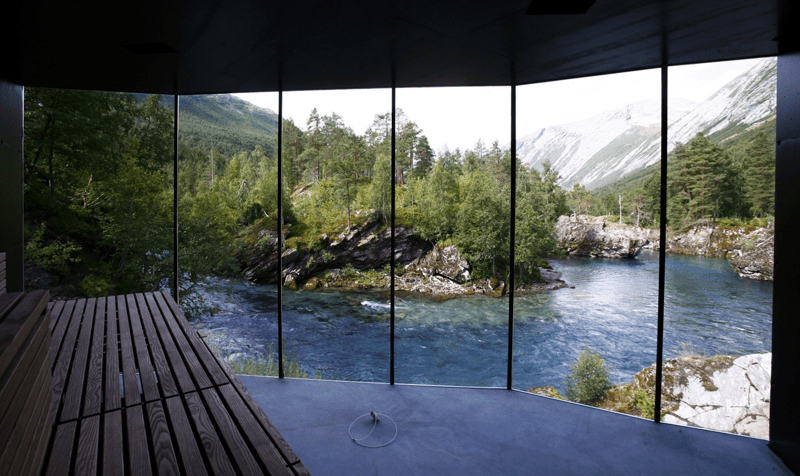 In real life, the mansion isn’t even a home at all – it’s the Juvet Landscape Hotel in Valldal, Norway. 1 | This image from the movie is a still from the film. Real exteriors meld with visual effects to create a technology billionaire’s secluded home.